Corvus Corax. Primarch of the XIX legion. The Liberator. The Deliverer. The Raven-Lord. Chooser of the Slain. The Shadowed Lord. Master of stealth, rapid strikes and decapitations. He is cunning and subtle, commanding his units with precision and guile, but all of this is guided by an uncompromising sense of justice and hope for the future of Humanity. In Part:1 I dove into Corax as an individual unit. In this article, I will take a look at him as a force multiplier and how this impacts a Raven Guard list. In general, I don't usually hear people write much about Corax as a force multiplier like they do with other Primarchs, but with the sire of the Raven Guard rule he is basically adding 2 more ways to play the list. This rule gives Raven Guard Acute senses and auto run of 6". Mass Jump pack infantry that start of the table. Works well with the Angels of Wrath. Mass Outflankers. Also works well with Angels of Wrath. So why build lists based on outflank instead of deepstrike or infiltrate? Well... three reasons. Point denial. Timing. Late game maneuverability. Outflanking armies can be very strong if built right and used correctly. So let's talk about outflank armies. Raven Guard have a huge advantage in that they can alpha strike and are thus basically playing with more points than their opponents, but the flip side is not letting your opponent remove points from from you. Using these 2 components together is even more powerful. Simply not deploying units protects them and gives your opponent less time to deal with them. So while a drop pod heavy force lets you null deploy first turn, an outflanking force can largely null deploy for most of the game, especially with some reserve manipulation built in the list. In addition, Corax himself is a unit that can be played defensively. This does two major things. One, it makes the points spent on Corax hard to kill. Second, it saves him until the later rounds when units are softened up. A large part of winning 30K is denying kill points to the enemy. With infiltrator armies, the goal is to create zones of superior fire power or hth influence. It's all about being on the right side of the mismatch. This is usually achieved by deploying heavy on a flank or deploying in such a way that you maximize the damage output of your units and minimize the damage output of your enemies units. The concept is easy to grasp from a "space" on the board perspective. But the concept of maximizing timing is usually overlooked. Long range shooting units, maximize their output by shooting every turn and shooting the appropriate targets. Short ranged shooting units. usually have more decisive weapons and usually only get to shoot their preferred target once a game, so maximizing their output is more about controlling when they shoot. Thus, for short range weapons, infiltrators with transports usually have a timing of turn 1 to 2. Walking infiltrators turn 2 to 3. Drop pods from turn 2 to 3. Flying transports are usually 3 to 4 as are outflankers. That said, maximizing short range shooting units is not as easy as just killing a long range shooting unit first turn. If the short ranged unit is immediately killed, you have basically just swapped pawns. So in any army of outflankers, the ideal scenario is a combination of not giving the long range enemy squad any good targets and then using your short ranged unit to eliminate them late in the game so the short ranged squads is still around for securing objectives. Outflanking forces with some reserve manipulation are powerful because they can pick and choose how to apply these concepts as the game progresses. Outflankers with long range weapons can create moments of fire superiority by catching units between terrain, or without cover or shooting side / rear armor facings. Outflankers with short range weapons can usually take out long range fire support with considerable less protection later in the game. Either because the protection has moved toward objectives or the bubble wrap squads have been killed. Finally the timing of HTH in outflanking armies is even more delayed. Usually, you will not be able to assault until 2 or even 3 turns after the turn they arrive, which sounds like a disadvantage, but transports are usually just another type of point and timing denial. Assaulting an objective late in the game with not enough time to be killed off or pushed off that objective is a very strong tactic if you can pull it off. This element is truly what Corax is helping maximize. Outflank with acute senses allows units that are coming onto the board where you want them. Raven guard also can manipulate reserve timing with Alvarex maun, comm relays and Damocles rhinos. Together, reserve manipulation and acute senses get units coming onto the board at the right times. In addition, 6" run can help units like foot sloggers with melta bombs grab objectives and hunt back field tanks. Harassers: Are units able to shoot units from afar while staying mobile. Eradicators: Are units able to decisively kill a target and then being able to take or contest an objective. Good Eradicator units: Seekers, Support squads, Mor Deythan, Termies w. combi weapons, destroyers with phosphex, vets with weapons. Any of these units in transports would qualify. Hammers: Are units that smash a unit off objectives and can hold it. Good Hammer units: Termies, command squads, vets with power weapons. Any of these units in transports. Spoiler: Are units that can stay alive unit the end of the game, they don't necessarily need to kill anything. Part: 1 focused on largely using Corax offensively. In general, the mindset is to throw Primarchs into the mix to try to get their points back. But, consider the concept of using Corax defensively as a counter assault unit. He's largely unkillable at range. He has a 24" bubble of anti deepstrike. He will basically murder anything that actually gets to you. Finally, he can jump into reserves and redeploy in the end game to be a late game threat. 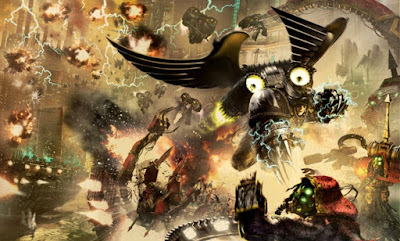 Corax's is an interesting Primarch partially because of his force multipliers. They open up new and interesting army types at high point levels, which make tactics that normally wouldn't be good at lower point level viable. And he opens up the use interesting units and list concepts that revolve around jump packers, or out flankers or even static resilient support elements.